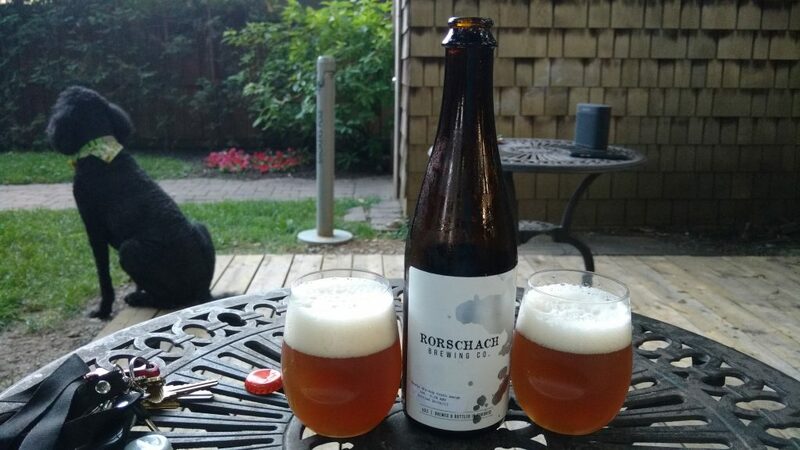 I try to make a point of stopping at Rorschach Brewing whenever I’m in the east end, since I don’t get out to this part of the city very often. It really helps that they have a large tap room, a very comfortable second floor patio, and their food menu is geared towards sharing so everything is under $11. It also helps that they are listed on the 2017 Craft Beer Passport, so your first 12 oz. pour is only $2. We stopped by the patio on Canada Day and made our way through most of their tap list that day. A bottle of Truth Serum, a double dry-hopped IPA weighing in at 6.5% ABV, followed me home. I believe a 500 ml bottle retails for around $6-7 in their bottle shop, but truth be told, I’m not sure. I also bought a t-shirt, and I didn’t keep the receipt given the state I was in. This is another example of the bottle tasting different at home compared to at the brewery. Our bottle was stamped with a bottled on date of June 26, so it was presumably from the same batch we had at the brewery on July 1. Appearance: Deep copper colour, with a thick, lasting off-white head. Unfiltered. Aroma: Pine needles. At first I thought it was coming from the pine tree I was sitting under, so I moved inside for a second sniff. Still piney. Taste: Stale pizza dough, bag of pine needles. I prefer the fruity profile of hops over the pine profile of late. Tasted livelier in the brewery, not sure if this got heat or light contamination on the way home. It sat in our fridge for 3 weeks before drinking. Suggested food pairing: Fries with Indian masala spice. Don’t over think the food, guys. Overall: I remember being enamoured with this option in the brewery, but I didn’t enjoy it nearly as much on our patio. I had it early on in our session at the brewery, so I don’t think my judgement was too clouded. Maybe that cab ride was warmer than I remembered on the way home and it affected the brew. Would try again just to be sure. Still an amazing brewery, with their beer best served there.